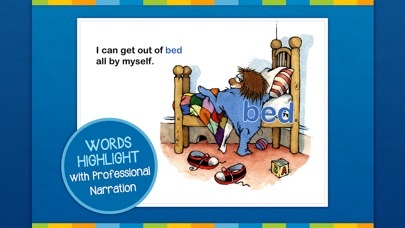 This app ("All by Myself") is more like a visual audiobook, but it lights up the words as it reads too... which is very nice for starting readers. I highly recommend this charming story in book and App format. 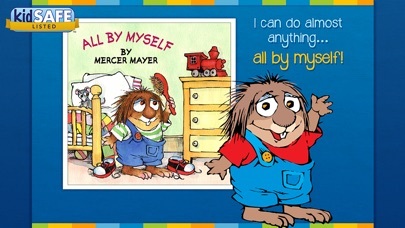 Oceanhouse has three of Mercer Mayer's Little Critter books in app-format, and a bunch of Dr. Suess too. Another company has done a cart-over of the Mercer Mayer's "Just Me and My Dad" Cd-Rom. Note to Oceanhouse: The Heart on Mom's dress currently shows the word "Heart," but it doesn't say it out loud. Hopefully this will be fixed on an update (?). most of the books are great representations of the original books. i think this one falls short and is missing too much content (words/pages). My toddler Sophia loves this book! Bought this on recommendation of A4cwsn and it is a super big hit. My daughter loves to listen to the Read To Me and find the hidden critters! Thanks for a great app! We were looking at all the Dr. Seuss books and came across Little Critter. Very enjoyable and keeps the kids entertained. 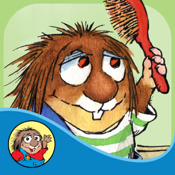 We want more Little Critter books. 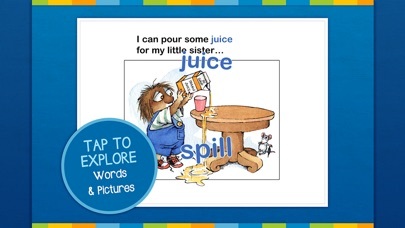 Kids loved the books and now LOVE the apps! 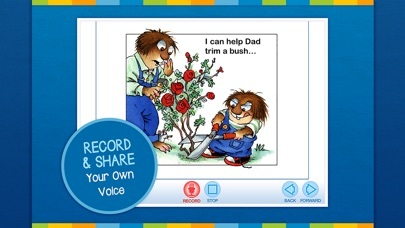 We are all fans of the books and glad to find these interactive stories for the iPad. Keep them coming! My daughter became familiar with the series through the app. Within one reading, she wanted to "read it by herself.". And again and again. So I feel the app did its job. The story is cute and simple in a way that the kids and parents enjoy. It is just right! Very good app for my kiddos, they love it. This app is a great addition to any household with a small child! Wonderful music! These books are simple and fun to read, perfect for my neice who loves 'em. The voiceover work is well done and there's a fun minigame where you find the mouse on each page. What can I say. Well done, cute story, good quality app. Not one of those just thrown together. My kids love it so I love it! My 3 yr old son can't get enough of the Dr. Seuss and Little Critter books. In fact he prefers the Little Critter books, because he love to search for the spiders, mice and grasshoppers thru out the pages. Two and three and they both ask to read it every day. So much love. My 2 1/2 year old loves it!!! Yes, I know it's a children's book, but my mother and I had a great time with this app too. When you tap each item on the page it reads the word to you, and it is fun to "Find" the mouse in each page and see if you got them all at the end. Guess it's good for all ages really! I grew up with these stories and love sharing them with my kids. My kids' favorite book comes to life! Great app, a definite must buy. This is a wonderful children's story. I bought it for my iPad, so that when my grandson is over, he might enjoy. I use to buy all the Mercer story books for his father when he was a little boy. I think the one where he goes to the doctor or dentist was helpful.....it took the fear out quite a bit. It's been 28 years, since I saw that book, so a little hard to remember. Can't wait to try this one out.